The Ferrari Daytona is one of the most classic Ferraris. Of the cars they built in the late-1960s and even through most the 1970s, these are the Ferraris everybody wants. And on top of that, there is the 365 GTS/4 – or Daytona Spider. These are exceptionally rare and highly prized and collectible. They were built by Scaglietti. And then there’s this. Only a handful of Ferrari Daytonas were custom-bodied and this is one of them. It is one of five custom-bodied Daytonas commissioned by Luigi Chinetti (the guy responsible for Ferrari being in America) – though not all were the same. 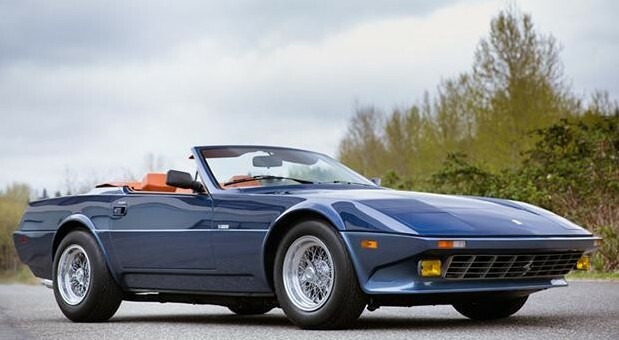 It was built as a 365 GTB/4 coupe and sold by Chinetti in Connecticut. He bought it back in 1976 and shipped it to Michelotti in Italy to receive this custom body. Michelotti designed it and built three just like it – all for Chinetti. It was finished in the colors you see and given to Mrs. Chinetti as a gift. The car also carries “NART” designation. N.A.R.T. stands for North American Racing Team – Chinetti’s race team that he used to tout the Ferrari marque around America. The engine is a standard 365 GTB 4.4-liter V-12 making 352 horsepower. The car was acquired by its current owner in 1991. It has never been restored and was refreshed before being brought to auction. Remarkably, it has covered only 1,568 miles in its life (not including when it was a Daytona coupe for five years). As you’ll see next week, this NART Spider is a bargain at $700,000-$1,000,000. That’s even cheap for a 365 GTS/4 Daytona Spider.